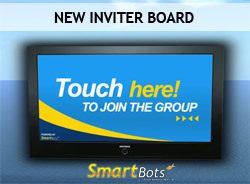 We’ve releases the new Inviter Board which displays several images, smoothly changing them. By default, board contains tho “Touch me” textures. The board looks simple and stylish. You can put your own office photo, logo and other images like short greeting for the visitors (see how we did this at the entrance of SmartBots office). As usual, new device is free and available at Second Life Marketplace. The board is menu-driven and can be configured as well as other Interface devices. To set the images, just drop them to the board (read the instructions inside the board).